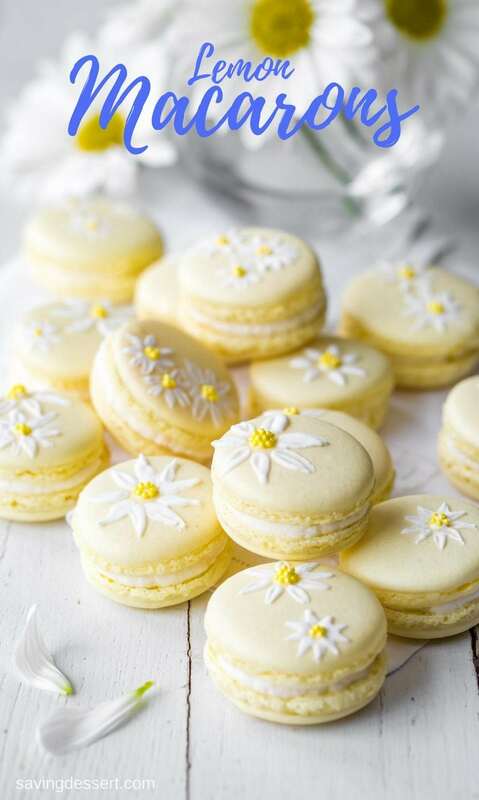 Brighten your day with these delicious Lemon Macarons decorated with a few brushstrokes of royal icing and sprinkles to help usher in the first warm days of spring. Darn groundhog. I know he’s not often correct with his prognostications, and obviously he can’t control the weather, and who listens to a rodent-forecaster anyway? The idea of another month of winter is sort of depressing but thankfully I don’t think it’s going to happen. We have a yard full of fat American robins enjoying group meet-ups, family reunions, first dates, worm digging adventures and plans for new nests, eggs and baby birds to come. The trees are starting to bud, and we’re just a month away from the spring equinox. Doesn’t all that sound lovely? We really don’t need, or want, more winter weather! It’s been a gray winter here in Virginia filled with blustery winds, bouts of cold and flu, and now the refreshing rainy days of early spring have arrived. I think Punxsutawney Phil was wrong. Again. Spring must be just around the corner! 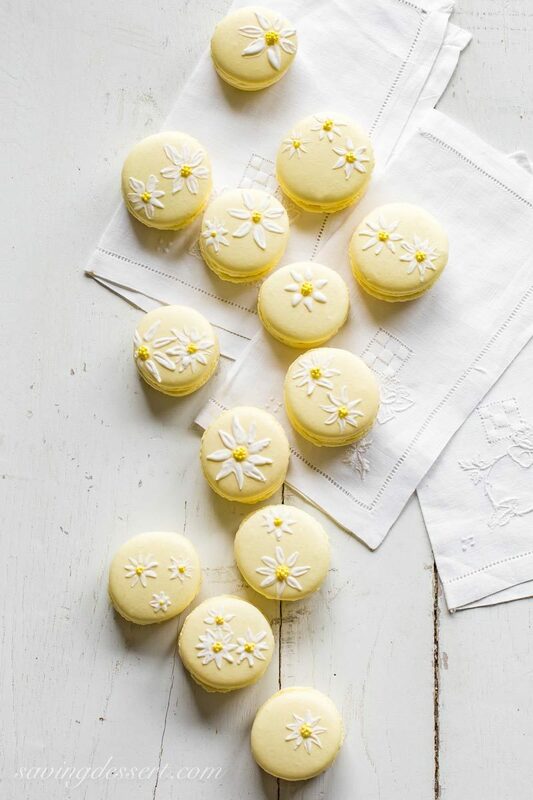 It had been such a long time since I made macarons, I thought I’d celebrate our first days of spring-like weather with daisies and the light, bright flavor of lemons. Once again I turned to my favorite Italian method of making macarons. To me, it’s a much more forgiving than the French method for making these wonderful little meringue cookies. 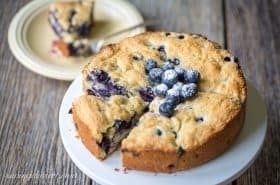 The batter doesn’t deflate as easily as the French mixture and I can’t tell the difference in the flavor, texture or appearance. In early 2014, I shared a post for Raspberry Macarons with lots of tips and how-to’s for the first-time macaron maker. 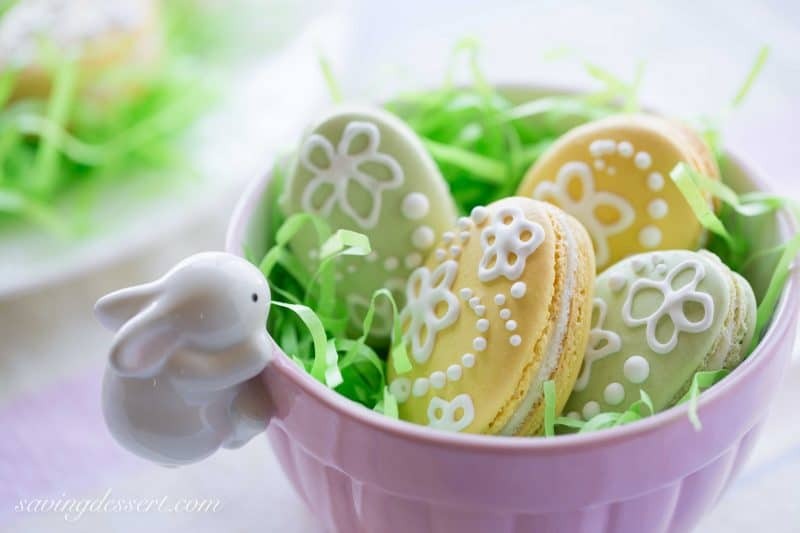 Then in 2015, I published another post for Easter egg decorated Macarons with White Chocolate-Mint Ganache (pictured above) with details and photos about making these cookies using the Italian method. Both posts may help in your quest for the perfect macaron recipe. I’ve made several other macarons over the years but feel these two posts may help you the most. The more you read about making macarons, the easier it will be. They are a simple cookie to make, if you follow the rules. Never make macarons on rainy days or days with high-humidity, and never, ever, ever add anything to the batter. I continue to try and defy this rule, but with no luck whatsoever. Macarons are a pretty sweet cookie, so choose a filling that’s not over-the-top sugary. Dark chocolate ganache is a great choice for a filling but doesn’t look very pretty on a light and bright daisy covered yellow macaron. White chocolate ganache works well too, just be sure to use very good quality white chocolate as the flavor varies greatly from brand to brand. 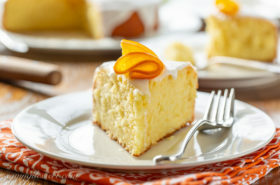 For this lemon filling, I made a buttercream frosting heavy on the cream cheese and butter, and used plenty of crystalized lemon to add tartness. You can play with the ratios if you don’t love the consistency by adding more powdered sugar, but again caution against making a super sweet filling. True Citrus crystalized lemon is a natural product I recently wrote about in a post for our favorite Lemon Coolers. 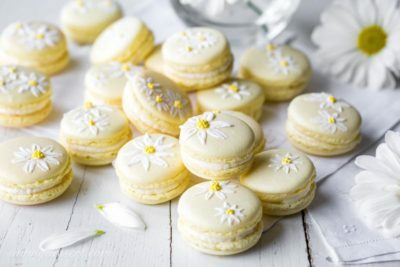 This unsweetened product adds so much intense lemon flavor without watering down the filling, it was the perfect choice for this macaron filling. If you don’t have True Lemon available to you, use fresh lemon juice, lemon zest or a small amount of lemon extract. I promise it will still be delicious. Prepare 2 sheets of parchment paper to fit a large rim-less baking sheet. 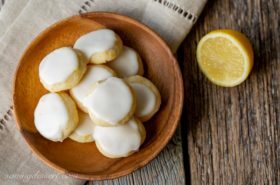 To ensure consistent sized cookies, trace a small biscuit cutter or shot glass (about 1 1/4-inches in diameter) on the parchment paper as a template then turn it over before pipping on the batter. Prepare a pastry bag fitted with a large round tip. Set aside. Each piece of parchment should hold about 30 rounds. In a large mixing bowl, sift together the almond meal and powdered sugar. Make a well in the center and add 55 grams of egg whites. Fold the mixture together with a spatula until it becomes a thick, paste-like batter. Set aside. Place the remaining 55 grams of egg whites in the large mixing bowl of a stand mixer fitted with the whisk attachment. Set aside. In a small to medium saucepan, combine the granulated sugar and water over medium heat. Stir until the sugar is dissolved. Attach a candy thermometer to the pan and heat to 225 degrees. Once the syrup reaches 225 degrees, turn on the stand mixer and beat the egg whites on high. Continue to beat the egg whites while cooking the syrup until it reaches 239 degrees. You want the meringue to be at soft peak stage so if it reaches that before the syrup reaches 239 degrees, turn the mixer down to low. Once the syrup reaches 239 degrees remove it from the heat and slowly pour the syrup into the egg whites while the mixer is running on low. Try to stream the syrup directly into the whites close to the side of the bowl so it won't cool too quickly. Once all the syrup has been added, whip on high for one minute, then reduce the speed to low and continue beating until the bowl has cooled slightly and glossy stiff peaks have formed. Add half the meringue to the cookie batter, gently folding until combined and somewhat smooth. Add half the remaining meringue to the batter (and any food color if using) and gently fold until incorporated. Finally add the remaining meringue and fold together until the batter is smooth. To test the consistency, pick up the spatula and if the batter ribbons back into the bowl, it is ready. It should be like lava blending back into itself after about a minute. If the batter is still too thick, fold with the spatula a few more turns, then test again. Continue until smooth but not deflated. Fill the prepared pastry bag with the macaron batter. Pipe the batter onto the prepared parchment paper rounds, but do not fill completely. The batter will spread a bit so only fill each round about two-thirds full. Once the first sheet is filled rap the pan on the counter top a few times to rupture any air bubbles trapped in the cookie. Rotate the pan and rap again. If using a rim-less baking sheet, you can now slide the parchment onto the counter-top to rest for 30-60 minutes which allows a hard outer shell to form. If you don't have a rimless baking sheet, you will need two prepared pans. Bake the cookies for 12-14 minutes (depending on size) or until you can gently lift the cookie off the parchment coming away clean. If the top separates from the bottom, they are not ready. Watch the cookies carefully as you don't want them to brown, just cook until set. Remove the entire sheet of parchment, with cookies intact, to a wire rack to cool. Once completely cooled, divide the cookies into pairs with others of similar size, then pipe one side with the desired filling. In a small mixing bowl, beat together the butter and cream cheese until blended. Add the powdered sugar and lemon crystals if using. Blend until combined. Scoop into a piping bag fitted with a round tip. Pipe filling onto the flat side of one cookie, then top with a matching size cookie, flat side to the filling. Refrigerate until ready to serve. Allow cookies to rest 15 minutes at room temperature before serving. Macarons are best a day or two after being made. Make a small batch of royal icing using the recipe on the Wilton Meringue Powder container. Transfer a heaping tablespoon of royal icing to a small finger bowl. Cover the remaining icing with a damp towel until needed. 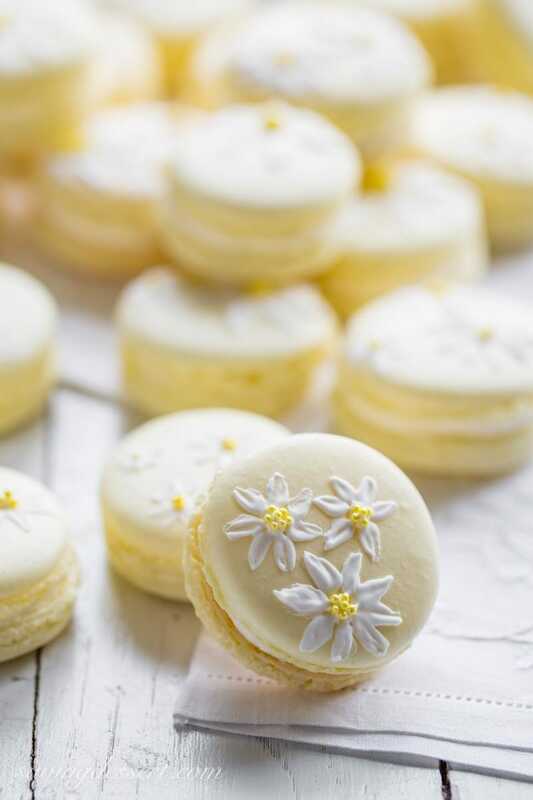 Using a small food-safe brush, decorate the tops of the macarons with flowers, designs and/or sprinkles as desired. Allow the icing to dry completely before storing in an airtight container. If you can't find True Lemon crystals, substitute 1 tablespoon fresh lemon juice, and the zest of 1 lemon. You can also try using 1/2 teaspoon lemon extract in place of the crystals if desired. True Lemon is made from crystalized lemon, with no added sugar, or preservatives. It can be found near the artificial sweeteners in the baking aisle of most grocery stores. Don't confuse this with the True Lemon Lemonade mix. Read over all directions (multiple times) before beginning to ensure you understand the flow of the recipe. Thanks so much for stopping by! I hope you have a beautiful week filled with spring-like weather and tons of fun. Happy baking! 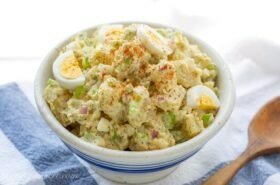 Could you use the eggs whites that come in a carton? I wouldn’t do that Dawn. Macarons are not hard to make but they can be stubborn – they don’t like change 🙂 I have never used eggs whites from a carton – not sure if there is anything added. Good luck. Beautiful job, Tricia! Wish you were still close by so you could bring them for Easter dinner! Amanda took a macaron class last weekend and she loved it and her macaroons were beautiful! Miss you and Ed! Your macarons are absolutely stunning, Tricia! A labor of love I’m sure and I can tell how delicious they are. 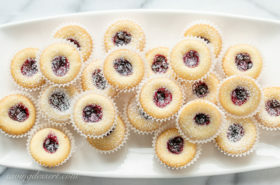 Love the lemon and pinning these to try! I dunno, freezing rain to be followed by snow here today, so that darn groundhog is looking mighty right. 🙁 But these would chase the gloom away! Such nice, bright flavor. Plus they’re gorgeous! Just wonderful — thanks. You outdid yourself here, Tricia. These are the prettiest macaroons I’ve ever seen. Stunning. These are absolutely gorgeous Tricia, I could never make them like that. You are very talented! Thank you very much Gerlinde – but I bet you could make these – they really are a simple cookie! Oh, my gosh, these are stunning, Tricia!! Your artistic talent is enviable!!! Well done. Thank you Liz – you made my day! These look wonderful, Tricia! I’ve only made macarons once, using the French method because that is what I learned in two different classes. It was quite a long process, the first time making them at home! However, they came out well, with feet etc. I’ve been hesitant to try the Italian method; your instructions are so clear I am encouraged to try that next. These would be perfect for a baby shower next month, as the baby’s gender is unknown. And if they aren’t good enough for that, they will be for me! Thank you Marlene – macarons are easily adaptable to holidays and events, such a perfect cookie! I hope you’ll give it a try, the Italian method really is simple, however you must have everything ready because it goes quickly. Thanks! Thanks Sally! So great to hear from you. Hope you are doing fantastic. Easter is a good time for macarons Monique – and I’ve never been able to figure out why people call them macaroons – not even close! I’m simply in awe of these gorgeous macarons, Tricia. I don’t have the guts to try to bake them myself, so I have to be content to sit and stare…I’ll be pinning and sharing for sure. Your decorations are spectacular!! I know you can make these Sue – and hope you will give them a try! Thanks so much for your kind words. Wow! 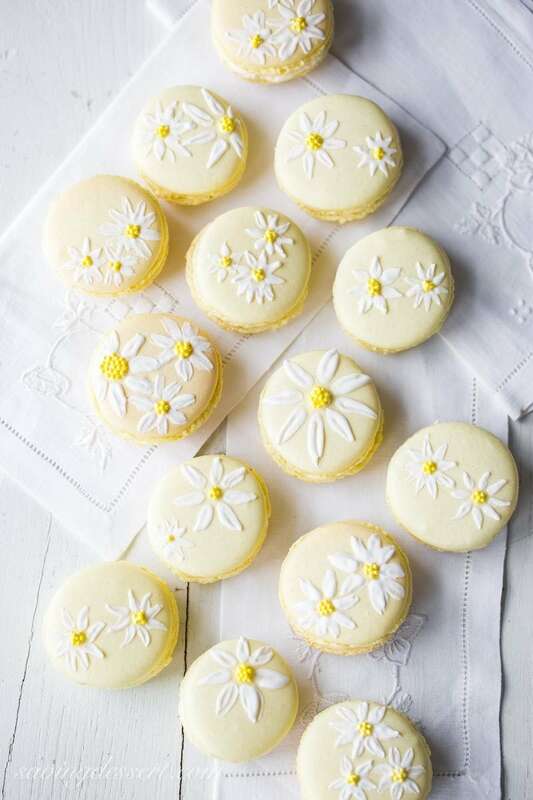 Absolutely beautiful and so perfect for a little touch of Spring 🙂 I’m overdue for making macarons, too, so I must try these! Thanks Angie – they are a fun project for sure!